Théodore Chassériau was born in Santo Domingo, now the Dominican Republic. His father was the French adventurer Benoît Chassériau (1788-1840). In 1820 the family went to Paris and in 1830 he entered the studio of Jean-Auguste-Dominique Ingres. He was the favourite pupil of Ingres until the latter left for Rome in 1834. In 1836 he first exhibited at the salon in Paris. In 1840 he went to Rome and there he met Ingres. But Ingres didn't agree with his work and they broke off relations. In 1844 the French state commissioned the decoration of the grand staircase of the Cour des Comptes and he completed this work in 1848. His work on the murals of the Churches of Saint-Roch and Saint-Philippe-du-Roule exhausted him and he died in 1856 at the age of 37. 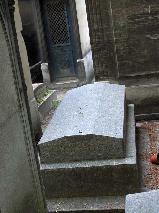 The grave of Théodore Chassériau at Montmartre Cimetière, Paris.